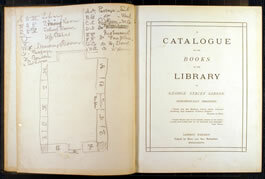 The diagram sketched in the front of the catalogue on the picture opposite shows how George Stacey Gibson's books were originally arranged at his home, Hill House, in Saffron Walden High Street. The books were catalogued using letters to denote subjects. I - Bibliography, librarianship, printing history etc. L - Botanical science, agriculture, horticulture etc. The same categories were used in the Institute Library and have been retained for the old books in the Town Library. Many of the books in the Town Library reflect the Gibson's interests. George Stacey Gibson was the author of The Flora of Essex, which explains why he collected so many books on botany and zoology. These can be seen in the bookcases. The collection reflects the Gibson family's interests. As brewers they had books on brewing and temperance and as bankers they collected books on finance. The major influence on George Stacey Gibson's book collection, above all else, was his Quaker faith. Catalogue of the library of George Stacey Gibson, 1880.